The Union Cabinet chaired by the Prime Minister, Shri Narendra Modi, today gave its approval for introduction of Gold Monetization Schemes (GMS), as announced in the Union Budget 2015-16. The objective of introducing the modifications in the schemes is to make the existing schemes more effective and to broaden the ambit of the existing schemes from merely mobilizing gold held by households and institutions in the country to putting this gold into productive use. The long-term objective which is sought through this arrangement is to reduce the country's reliance on the import of gold to meet domestic demand. GMS would benefit the Indian gems and jewellery sector which is a major contributor to India's exports. In fiscal year 2014-15, gems and jewellery constituted 12 per cent of India's total exports and the value of gold items alone was more than $13 billion (provisional figures). The mobilized gold will also supplement RBI’s gold reserves and will help in reducing the government's borrowing cost. The revamped Gold Deposit Scheme (GDS) and the Gold Metal Loan (GML) Scheme involves changes in the scheme guidelines only. The risk of gold price changes will be borne by the Gold Reserve Fund that is being created. The benefit to the Government is in terms of reduction in the cost of borrowing, which will be transferred to the Gold Reserve Fund. The scheme will help in mobilizing the large amount of gold lying as an idle asset with households, trusts and various institutions in India and will provide a fillip to the gems and jewellery sector. Over the course of time this is also expected to reduce the country's dependence on the import of gold. The new scheme consists of the revamped GDS and a revamped GML Scheme. Out of the 331 Assaying and Hallmarking Centres spread across various parts of the country, those which will meet criteria as specified by Bureau of Indian Standards (BIS) will be allowed to act as Collection and Purity Testing 1 Centres for purity of gold for the purpose of this scheme. The minimum quantity of gold that a customer can bring is proposed to be set at 30 grains. Gold can be in any form (bullion or jewellery). The number of these centres is expected to increase with time. In the revamped scheme, a Gold Savings Account will be opened by customers at any time, with KYC norms, as applicable. This account would be denominated in grams of gold. Collection and purity testing centres will send the gold to the refiners. The refiners will keep the gold in their ware-houses, unless banks prefer to hold it themselves. For the services provided by the refiners, they will be paid a fee by the banks, as decided by them, mutually. The customer will not be charged. The banks will enter into a tripartite Legal Agreement with refiners and Collection and Purity Testing Centres that are selected by them to be their partners in the scheme. The deposits under the revamped scheme can be made for a short-term period of 1-3 years (with a roll out in multiples of one year); a medium-term period of 5-7 years and a long-term period, of 12-15 years (as decided from time to time). Like a fixed deposit, breaking of lock-in period will be allowed in either of the options and there would be a penalty on premature redemption (including part withdrawal). The amount of interest rate payable for deposits made for the short-term period would be decided by banks on basis of prevailing international lease rates, other costs, market conditions etc. and will be denominated in grams of gold. For the medium and long-term deposits, the rate of interest (and fees to be paid to the bank for their services) will be decided by the government, in consultation with the RBI from time to time. The interest rate for the medium and long-term deposits will be denominated and payable in rupees, based on the value of gold deposited. 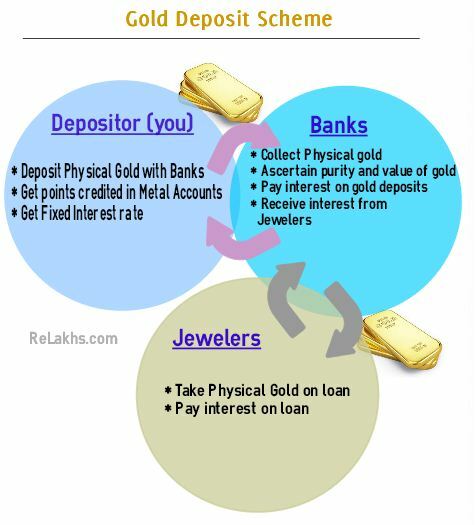 For short-term deposits, the customer will have the option of redemption, for the principal deposit and interest earned, either in cash (in equivalent rupees of the weight of deposited gold at the prices prevailing at the time of redemption) or in gold (of the same weight of gold as deposited), which will have to be exercised at the time of making the deposit. In case the customer will like to change the option, it will be allowed at the bank's discretion. Redemption of fractional quantity (for which a standard gold bar/coin is not available) would be paid in cash. For medium and long-term deposits, redemption will be only in cash, in equivalent rupees of the weight of the deposited gold at the prices prevailing at the time of redemption. The interest earned will however be based on the value of gold at the deposit on the interest rate as decided. · Tax Exemption: Tax exemptions, same as those available under GDS would be made available to customers, in the revamped GDS, as applicable. · Gold Reserve Fund: The difference between the current borrowing cost for the Government and the interest rate paid by the Government under the medium/long term deposit will be credited to the Gold Reserve Fund.